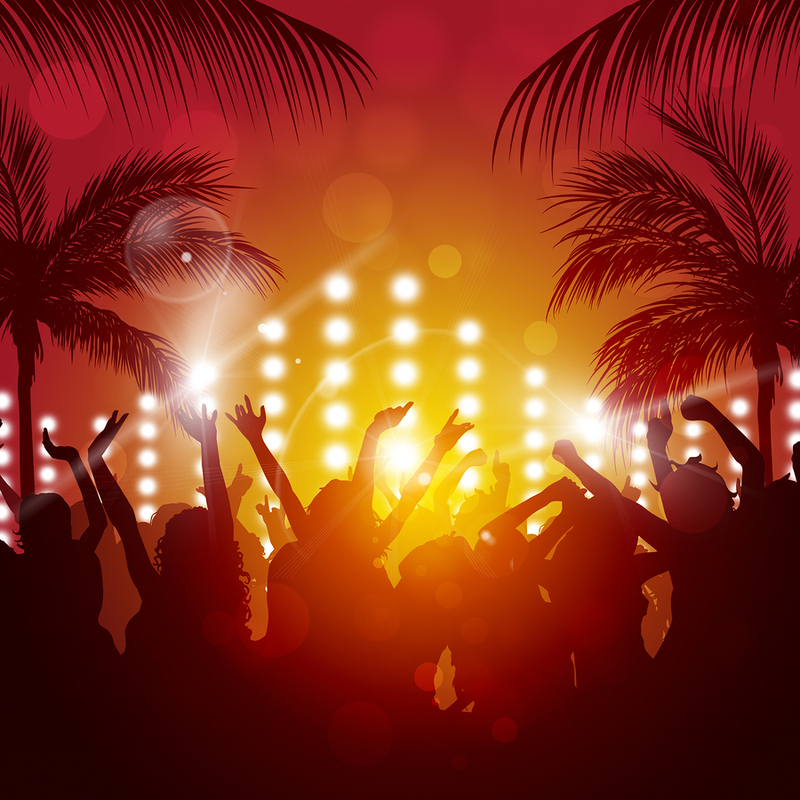 The nightlife on South Beach is so extensive that there’s an almost endless list of places to go and things to do. If listening to live music happens to be among your favorite nightlife activities, the city of Miami has you covered. The music selection in Miami is almost as diverse as the city itself, and that means you’ll have plenty of good options at your disposal, no matter what type of music you prefer. If you’re having trouble finding the right place for you, here are a few of the top places in Miami to listen to live music. The Klipsch Amphitheater in Bayfront Park may be the best place in Miami to kick back, relax, and listen to music on a sunny day or a warm evening. There are seats close to the stage, as well as a hilly lawn where guests can set up a blanket to lay down and enjoy something to eat and drink during the show. Some of Miami’s best food trucks usually set up shop nearby so there are plenty of great food options available. The Amphitheater plays host to music festivals of all kinds of genres, from rock to rap and reggae to jazz, so it’s just a matter of time until the Bayfront Amphitheater will host a show that interests you. If you don’t mind a dive bar, you’ll like going to Churchill’s. You’ll hear mostly local bands, but sometimes you’ll be privy to an up-and-coming artist before they hit it big, giving you the chance to say you saw them way back when. It’s not the prettiest place on the inside, but Churchill’s has cheap drinks, good pub fare, and plenty to do outside of its music, such as playing pool, the Space Invaders video game, or watching sports, although music is typically Churchill’s main attraction. This place does not have a sign outside its entrance, so you have to know where to find it in Miami’s Design District. Of course, this just means that everyone who finds their way to Bardot on any given night of the week is there to enjoy one of Miami’s best music venues. The sound system is out of this world and unlike anything you’ve heard in any club or music venue you’ve visited before. The types of musicians who perform at Bardot changes from one night to the next, but it often includes local musicians, indie pop, hip-hop, and well-known DJs who make the walls inside vibrate. If you want a more laid back and classy musical environment, check out the Regent Cocktail Club inside the Gale Hotel on South Beach. Aside from having a beautiful 1920s ambiance and some of the most skilled bartenders on South Beach, the Regent Cocktail Club also offers live music via its elegant piano almost every night of the week. If you want to relax with a world-class cocktail and listen to beautifully played jazz music in an old-time speakeasy, this is the place for you. Some people come to Miami to sit at the beach, while others come for the wild nightlife. But there’s also a large contingent of people who pass on all that and come to Miami to partake in water sports, among the most popular of which is kayaking. With all the waterways the Miami area has to offer, it’s easy to just slip your kayak in the water and paddle your way through spectacular scenery for hours on end. Whether you’re an experienced kayaker or someone who wants to give it a try, here are some of the best spots in Miami to go kayaking. Key Biscayne is a barrier island south of the city of Miami and an incredible place to go kayaking. The whole island is full of beachfront parks that you can see and explore while paddling your kayak right off the coast. The water is relatively calm so you don’t have to be an expert kayaker to handle it and you don’t have to worry about drifting out to sea. 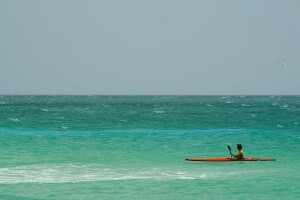 If you like kayaking with freedom and without being confined to trails, the coast of Key Biscayne is the place to go. At the same time, the island does have plenty of beautiful harbors and picturesque estuaries to explore if you want to play it safe but still enjoy yourself. 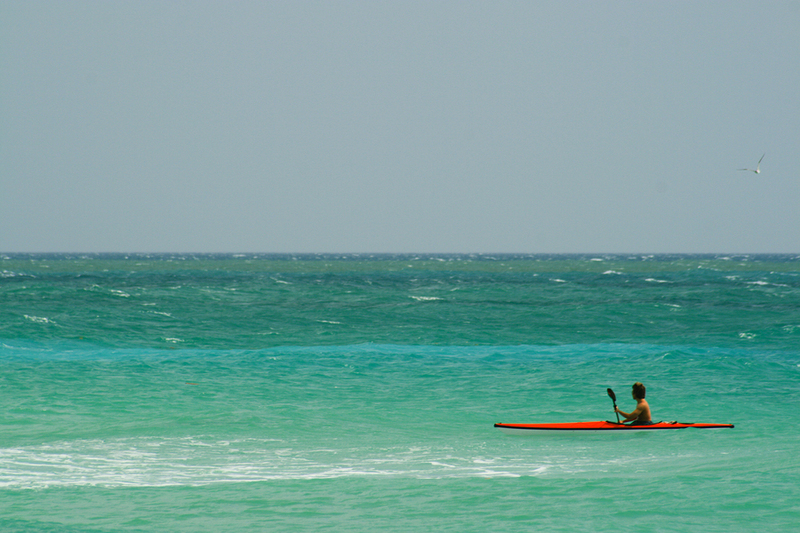 On the north side of Miami is Oleta River State Park, a haven for those who love kayaking and beautiful scenery. The park is on the shores of Biscayne Bay and is full of estuaries that are perfect for exploring via kayak, canoe, or any other type of self-propelled water vehicle. While you kayak your way around, you’ll be privy to the delightful sights of mangrove roots, small fish, and a wide variety of birds. If you’re a novice, it’s easy to rent kayaks inside the park, and once you’ve taken in all the scenery and tired yourself out from kayaking all day, you can relax at the Blue Marlin Fish House, a watering hole with fine food and drink located inside Oleta River State Park and the perfect place to finish off a day of kayaking. Finally, if you’re a kayaking enthusiast who’s up for a little road trip, you have to visit Everglades National Park. The Everglades has no shortage of trails for kayaks and canoes, and while not all of them are easy, they are a great way to see all the amazing scenery and wildlife that can be found in the Everglades. If you’re not a seasoned and serious kayaker, this may not be for you, but kayaking your way through the Everglades is a truly unique experience, and if you’re a kayaker in the city of Miami, it’s definitely worth the trip. Admittedly, Miami isn’t the most Irish city in the country. It’s incredibly multicultural, but much of that culture comes from the Caribbean and Latin America, not from our Irish friends across the pond. Nevertheless, Miami is known for its nightlife, making it a great place to party 365 days out of the year. 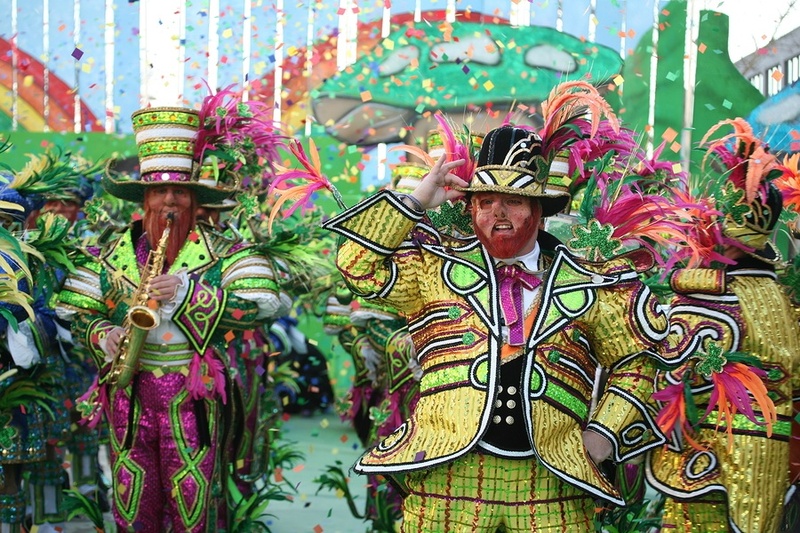 Of course, this includes one of the year’s ultimate party days: St. Patrick’s Day. 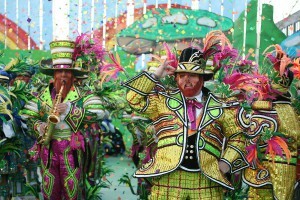 So while Miami may not be all that Irish, here are some great places in Miami to party on St. Patrick’s Day. A great way to get your St. Patrick’s Day celebration underway is attending the annual St. Patrick’s Day Festival in Coral Gables. Taking place at the plush Ponce Circle Park on Saturday, March 12th from 12 PM to 6 PM, the festival is free to attend is guaranteed to be fun for the whole family. There will be Irish music galore, Irish dancers, Irish arts & crafts, and plenty of Irish delicacies for you to enjoy, including corned beef & cabbage, shepherd’s pie, soda bread, and authentic Irish coffee. For the kids, there will be a merry-go-round, bounce house, rock climbing, and a giant slide. Finally, for those who want to celebrate St. Patrick’s Day the old-fashioned way, there will also be a full service bar. John Martin’s is one of South Florida’s most popular Irish pubs and restaurants, and this year it will be hosting its 27th annual St. Patrick’s Day Party. Starting at noon on St. Patrick’s Day, St. Martin’s will have a host of Irish musical performances, including everything from bagpipes to the Irish fiddle. Then at 9 PM, the musical keys get handed over to a DJ, who will take partiers well into the night. Of course, being a much-celebrated Irish bar, John Martin’s will have plenty of Guinness flowing to go along with fantastic appetizers that will ensure your taste buds are more than satisfied all St. Patrick’s Day long. Located right in downtown Miami, Fado Irish Pub has become one of the most popular St. Patrick’s Day destinations in South Florida over the past few years. At this Irish bar in Mary Brickell Village, the party starts on Saturday March 12th and lasts all week. On Saturday the 12th, Fado is hosting the largest outdoor St. Patrick’s Day party in Miami, featuring a duel between DJs, as DJ BL Stylz battles DJ LS from Miami’s Battle 96 radio station. Fado will keep the party going all week long, including pub trivia on Tuesday the 15th that includes a grand prize of $1,000 and a happy hour from 6 to 9 PM on Wednesday the 16th that includes a raffle benefiting the non-profit organization Alfalit International. Then on St. Patrick’s Day, Fado will be opening early for brunch from 10 AM to 12 PM, followed by a party on the patio, with the outdoor festival at Mary Brickell Village kicking off at 5 PM and St. Patty’s Day celebrations lasting well into the night. After being closed for much of the winter while undergoing renovations, one of South Florida’s most beautiful and enjoyable attractions is getting ready to re-open this March to the delight of many. Of course, we are talking about the spectacular Venetian Pool in the city of Coral Gables, just outside the heart of Miami. If you’ve never enjoyed a day at the Venetian Pool, you don’t know what you’re missing, and whether you’ve been there or not, you’ll want to visit one of the quintessential Miami hotspots when he re-opens this month. So what makes Venetian Pool such a special place? Even if you have your own pool, it’s not as nice as a trip to the Venetian Pool. In fact, even some of the best pools at Miami’s many five-star hotels can’t compare to the Venetian Pool. It is the largest freshwater pool in the country, with fresh water being supplied daily from artesian wells. Swimming in freshwater is simply a different experience than swimming anywhere else. The water is cool, crystal clear, and chemical free, and swimming in an ordinary pool, or even the ocean, just can’t compare to the feeling of a freshwater pool. Both kids and adults alike will have plenty of room to roam and use the pool for their favorite water activity, whether it be swimming laps, playing games, or just relaxing and enjoying the feeling of the water on your skin. In addition to providing a unique swimming experience, Venetian Pool also has magnificent surroundings. There is a waterfall that will make you feel like you’re swimming out in nature, miles from civilization. Venetian Pool also features a beautiful grotto with all-natural caves that guests are free to explore at their leisure. Even if you tire out from too much swimming, you’ll be more than happy to sit and relax and enjoy the beautiful scenery provided by the Venetian Pool. Whether you’re having a birthday party, family reunion, or just need an excuse to have a pool party, Venetian Pool provides the perfect location and can accommodate a party of up to 35 people. The pool is so big that there is plenty of space for both large parties and guests who have come in off the street without the pool becoming too crowded. Pre-arranged parties at Venetian Pool get their own area either on the patio or beach, a decent meal, and free range to enjoy the pool. Venetian Pool can even be rented after hours for a wedding or private event. Between the pool, the waterfalls, and the palm trees, Venetian Pool is a beautiful setting for whatever special occasion you want to celebrate.